Sonus Loci is a project of scapes: landscapes, soundscapes, and escape. 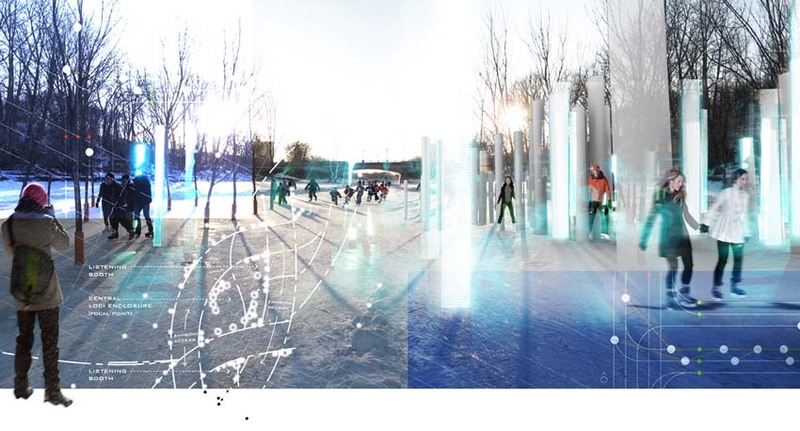 The landscape created by this site specific work, at the confluence of the Red and Assiniboine rivers, naturally amplifies and transforms wind, a winter agent that causes even the most hardy of Canadians to seek shelter from its bite on a cold winter night. Quieted by shelter, wind continues to sing, howl and moan, making its presence known. Slowly populating the landscape, first one, then two, clusters of five, seven, and then many, increasing like a crescendo of voices in a choir; a landscape of white phosphorescent sounding tubes emerge from the scored ice of the Red River Mutual Trail. Each sonical tube harnesses the energy of the wind to create a unique tone, and at the centre of this polyphonic chorus, the Sonus Loci - offering shelter to those who encounter it, passing through along their course. The anthem of this melodic garden of sounding tubes, a chorus of timbres and textures, strikes a chord - balancing the power of this ephemeral landscape’s sound of silence.